hipro.biz is a hybrid ICO project that includes a deposit and partner component of classical investment funds. Our company is engaged in the implementation of the latest blockchain developments in modern financial systems. By joining our company you will increase your share in our company even before the distribution of hipro-tokens. First of all, the company is working to create a decentralized ecosystem to manage the crypto-currency packages of our investors. The main purpose of our site is to meet the needs of companies and individuals in the areas of digital asset management, exchange and trade of crypto-currencies, digital banking, cryptanalysis and promotion of ICO, as well as crypto-currency loans. +0.78 Received Payment 0.78 USD from account U15147344. Memo: API Payment. Withdraw to ProfitHuntersBIZ from hipro.biz. +12.87 Received Payment 12.87 USD from account U15147344. Memo: API Payment. Withdraw to ProfitHuntersBIZ from hipro.biz. +1.2 Received Payment 1.2 USD from account U15147344. Memo: API Payment. Withdraw to ProfitHuntersBIZ from hipro.biz. +9.78 Received Payment 9.78 USD from account U15147344. Memo: API Payment. Withdraw to ProfitHuntersBIZ from hipro.biz. +7.5 Received Payment 7.5 USD from account U15147344. Memo: API Payment. Withdraw to ProfitHuntersBIZ from hipro.biz. +6.00 Received Payment 6.00 USD from account U15147344. Memo: API Payment. 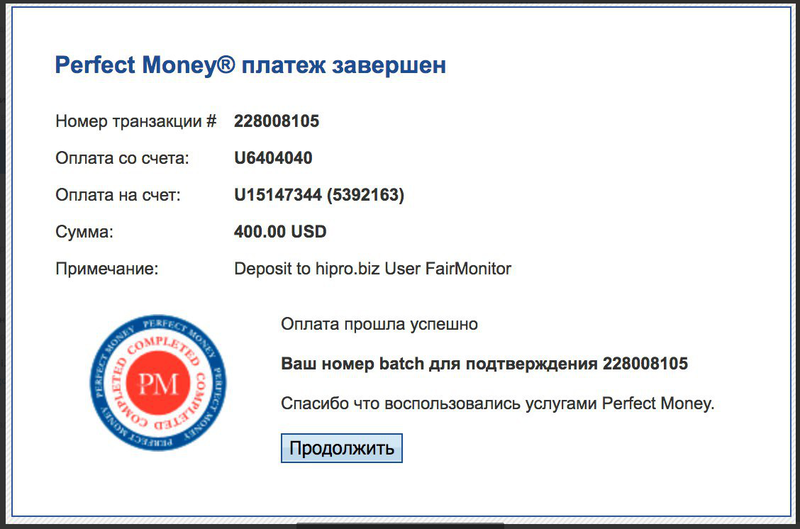 Withdraw to FairMonitor from hipro.biz. The amount of 0.1 USD has been deposited to your account. Accounts: U15147344->U4222871. Memo: API Payment. Withdraw to nelomota from hipro.biz.. Date: 10:01 14.09.18. Batch: 228315344. +4.5 Received Payment 4.5 USD from account U15147344. Memo: API Payment. Withdraw to ProfitHuntersBIZ from hipro.biz.